Rarely, there’s anything more dry than an LA Unified committee meeting, where the minutia of reports and statistics are vetted before they make their way to the full school board. But as the laboratory for forward-thinking ideas surrounding school discipline, meetings of the Successful School Climate Committee are typically anything but dull. Chaired by board member Monica Garcia, the committee was formed in 2013 not long after the groundbreaking School Climate Bill of Rights was passed. The measure was the first effort by a large school district in the nation to reverse the trend of “zero tolerance” by adopting restorative justice techniques and ending “willful defiance” suspensions and expulsions. Much of the committee’s work focuses on issues surrounding the bill of rights and efforts to increase graduation rates by sending students to outside counseling instead of court and by having counselors work with troubled youth instead of suspending or expelling them. The shift requires nuanced and complicated efforts by school officials, and the Successful School Climate Committee is where many of the district’s ideas are hashed out. “The committee gave us the forum to learn together about what works and then to hold the district accountable to do what it said what it was going to do,” Garcia told LA School Report. “I’m most invested in helping us stay focused on that it’s all of us together, its not just one data piece or one instructional program, but really the comprehensive view of the lives of young people,” she added. The committee includes Los Angeles School Police Chief Steven Zipperman, Chief Deputy Superintendent Michelle King, Roosevelt High School teacher Jorge Lopez, Garfield High principal Jose Huerta, community member Sharon Watson, LA County Board of Supervisors District 1 Probation Chief Dave Mitchell and representatives from Public Counsel, CADRE and InnerCity Struggle. Alternative approaches to suspensions and expulsions started to draw district interest about four years ago. “As we looked the data, we saw that suspensions were not being used as the last straw. It was sometimes the first straw, and we saw that willful defiance was the biggest problem,” Garcia said. When the school board passed the bill of rights, it made headlines around the nation, leading districts in other states to replicate the idea. “Restorative justice is the new brand for good work. It’s the new brand around relationship and community building. And it’s the new brand around ‘effective,'” Garcia said. Is it working? 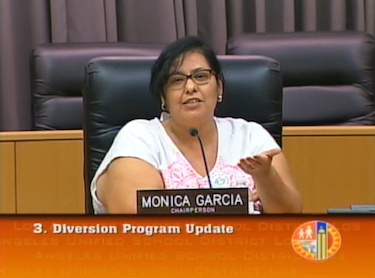 Garcia said the proof is in the city’s traditional public schools. The district suspended 14,057 students during the 2011-12 school year. Two years later, the number fell to 5,476. During the same period, graduation rates rose, and according to Garcia’s office, the drop in suspensions from 2012-13 to 2013-14, alone, saved the district $249,302. The district’s most recent focus on restorative justice this school year has been the diversion program, which has reduced the number of student citations and arrests for low-level offenses. Critics of restorative justice, like those featured in a recent NY Post story, say it is backfiring and, while reducing suspensions, has led to an increase in infractions. But that has not been the case in LA Unified. Despite the recent success of increasing graduation rates and reducing suspensions, LA Unified will likely be limited in what it can do until California changes its priorities. The next meeting of the Successful School Climate Committee is scheduled for May 5.